WASHINGTON, D.C. -- Gallup's U.S. Job Creation Index continued to climb to +25 in April from +23 in March. The index in April is one point shy of the all-time high found in January 2008, the first month Gallup began tracking hiring daily. The index is based on employee reports of hiring and layoffs at their workplaces. The U.S. Job Creation Index had a strong start in early 2008, but it began to fall later that year as the economy plunged into a recession. The index fell to a record low of -5 in both February and April 2009. Since then, the index has slowly recovered and registered averages in the low twenties starting in early 2012. It hovered in the high teens and low twenties through 2012 and 2013 before steadily rising in 2014. The results for April are based on interviews with more than 16,000 full- and part-time workers. The index score of +25 reflects 39% of employees nationwide saying their employers are hiring workers and expanding the size of its workforce and 14% of employees saying their employers are letting workers go and reducing the size of their workforce. 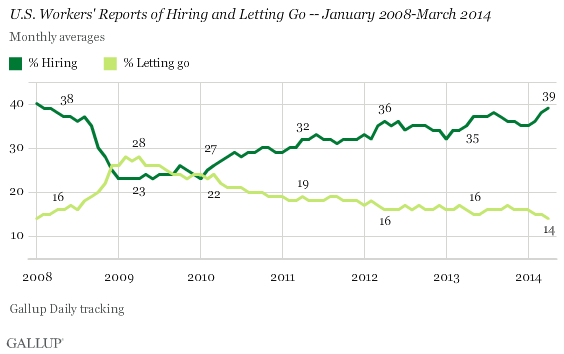 The percentage of employees who report their employers are letting workers go is the lowest Gallup has recorded, tied with 14% measured in January 2008. 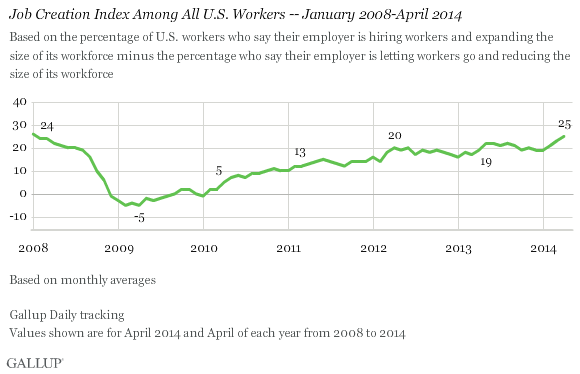 A remaining 41% of U.S. workers in April say their company is not changing the size of its workforce. Nongovernment job creation increased to +28 in April from +26 in March and is the highest Gallup has recorded since it began asking about government vs. nongovernment work in August 2008. Government job creation -- based on reports from those who identify their place of employment as local, state, or federal government -- was +12, similar to the +13 recorded the last two months. Since 2010, nongovernment workers have reported a more positive hiring situation than government workers have. Within the government employment sector, the job creation situation remains most positive at the state level (+20) followed by the local level (+13). The federal government trails behind both, with an index of -1.This score indicates that the federal government is basically at a standstill in terms of net hiring. The overall U.S. Job Creation Index is primarily driven by nongovernment workers' perceptions of the hiring situation in their workplaces because more workers are employed in the nongovernment sector than in the government employment sector. Nongovernment net hiring tends to rise early in the year -- as has been the case in 2014 -- but then generally levels off or drops slightly later in the year. The recent rise in employee reports of hiring is a positive sign that the economic slowdown may be ending. More companies may be doing better than in recent years and thus are looking to increase the size of their workforces. Gallup's measure of the U.S. Payroll to Population employment rate was also up slightly in April, which supports the rise in job creation, but the first quarter average in 2014 is down somewhat from the first quarter average in 2013. The current U.S. Job Creation Index signals that roughly the same percentage of employers are hiring new workers and increasing their staff now as they were in early 2008 before the recession took hold and before the stock market crash later that year. Results for this Gallup poll are based on telephone interviews conducted April 1-30, 2014, on the Gallup Daily tracking survey, with a random sample of 16,641 employed adults, aged 18 and older, living in all 50 U.S. states and the District of Columbia. For results based on the total sample of workers, the margin of sampling error is ±1 percentage point at the 95% confidence level. In 2008, most Americans planned to rely on their 401(k)s as a major source of retirement income. In 2014, while the percentage who plan to rely on a 401(k) is rising, it still has not reached what Gallup found prior to the recession. The U.S. Payroll to Population employment rate was 43.4% in April, up slightly from 42.7% in March. The average P2P rate for the first quarter of 2014, however, is below the 2012 and 2013 first-quarter averages. Nearly eight in 10 U.S. workers say the ability to use a computer or mobile device to work remotely is a positive development. Men, young workers, the most educated, and highest earners are most likely to log in frequently after work.